The Volunteer Chief from the District Heights Fire/EMS Station was involved in a 2-vehicle motor vehicle crash while responding on a call. At around 7:00 pm, Monday, February 20, the chief officer was responding to an emergency incident with lights and audible warning devices on. 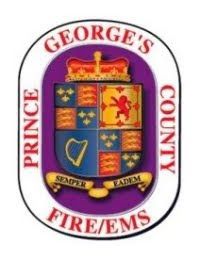 While clearing the intersection of Pennsylvania Avenue and Donnell Drive a civilian vehicle collided with the Fire Department vehicle. The lone occupant of the civilian vehicle, an adult female, was transported to an area hospital with injuries to her lower extremities. The volunteer chief, an adult male, was transported to the same hospital with pain and discomfort in his upper body. Both vehicles sustained significant damage and could be totaled. The County Police Department are investigating the incident. As a matter of standard operating procedure the operator of the fire department vehicle will undergo a post-crash screening. At about 6:30 pm this evening a vehicle left the road and drove through the large glass windows of a Kentucky Fried Chicken Restaurant in Landover. At about 6:30 pm fire/EMS units responded to the intersection of Sheriff Road and Martin Luther King Highway in Landover. Firefighter/Medics arrived to find a vehicle inside the KFC with 1 patron (see updated info below) sustaining fatal injuries after being struck by the vehicle. Four other people have been injured but none appear to be serious. The Departments Collapse Team is on location to secure the structure so an investigation can begin. The County Police PIO will provide additional information about the investigation. Four other people sustained injuries; one person refused transport to a hospital and three were transported to a nearby hospital with non-life threatening injuries. The County Police have determined that the deceased was not a patron of KFC. Their investigation continues. Please contact the County Police PIO for additional information. It is with deep regret that we announce that the 2-year-old girl rescued by firefighters from her District Heights home has succommed to her injuries. On Friday, February 17, about 1:45 am, firefighters operated at the scene of a fire inside of a 2-story duplex home on Hil-Mar Drive. Firefighters used ground ladders to access the 2nd floor bedroom of the young child. She was removed, treated for smoke inhalation injuires and transported to a hospital in "Critical" condition. Despite the very best efforts of firefighters, police officers, paramedics, and medical professionals, Mariah Kendra Hood, DOB 11-5-2009, passed away at Childrens Hospital on Sunday afternoon, February 19, 2012. An autopsy will be performed to determine the cause of death. Fire Investigators have labeled this fire as "accidental" and is attributed to unattended cooking. Fire loss is estimated at $50,000. A working smoke alarm did sound alerting a family member.